The audio is slightly upgraded to DTS:X (from DTS-HD Master audio 7.1). The now infamous roar in Jurassic Park is full and vibrates throughout your entire house. It is hard to believe that our love affair with dinosaurs was satisfied twenty-five years ago when Jurassic Park "roared" into movie theaters worldwide. The film became a phenomenon and sparked the imagination of scientists everywhere. Imagine being able to create dinosaurs from their own fossilized DNA. The film was so successful that is spawned two sequels and launched a highly successful, reimagined version – Jurassic World - that came out in 2015. As we anticipate the release of that film's sequel this summer, we are now treated to the first four movies on 4K UHD, Blu-ray, and Digital HD. Of course, there is nothing like the original and that is certainly true here. In the first film, a group of scientists goes to an island owned by a businessman. Once there, they learn that he has been able to use DNA to bring dinosaurs back to life. In the second film, the dinosaur park is abandoned but scientists are there studying these creatures. Of course, there is an antagonist in the form of the wealthy businessman's evil nephew who plans to capture the dinosaurs and bring them to San Diego. Predictably, this plan is incredibly flawed and doesn't end well. The third installment is the weakest of the bunch and is not based on Michael Creighton's novels. Here we get a group of individuals - both scientists and a divorced couple - who all go looking for the couple's missing son. The stars of this third one are most definitely the dinosaurs since the plot and CGI are weaker than the first two. Fourteen years later, we get to revisit this realm as Jurassic World shows the island functioning as an amusement park/zoo of sorts and stars Chris Pratt (Parks and Recreation) and Bryce Dallas Howard (The Help). Chapter five in the series is slated to open June 22, 2018 (Universal and FlickDirect Florida will be hosting a screening on June 19th, 2018). The 2160p High Definition video transfer serves this series well. While not a huge difference from the original Blu-ray, there are some subtle details that can be enjoyed with the enhanced viewing platform. The original is the best of the first three as the CGI was done with more time and care than the latter two. Of course, Jurassic World is like comparing apples to oranges. Since it was filmed with the latest technologies the video quality is excellent and the special effects can be seen in sharp contrast. The audio is slightly upgraded as well, to DTS:X (from DTS-HD Master audio 7.1). The now infamous roar in Jurassic Park is full and vibrates throughout your entire house, but the enhanced audio is most evident in Jurassic World. Again, the updated technology in filming makes for a truly immersive experience that envelopes the viewer and surrounds them with all manner of effects. Archival Featurettes: The Making of The Lost World; Original Featurette on the Making of the Film; The Jurassic Park Phenomenon: A Discussion with Author Michael Crichton; and The Compie Dance Number. Behind the Scenes: ILM & The Lost World: Before & After the Visual Effects; Production Archives; and Storyboards gallery. 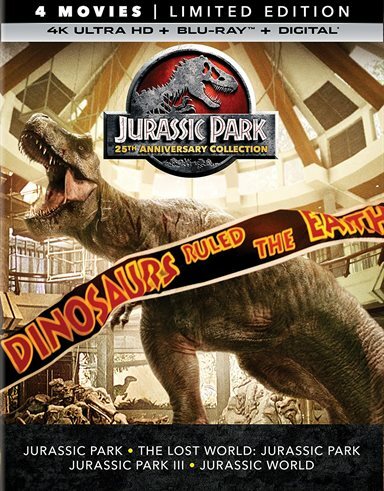 Archival Featurettes: The Making of Jurassic Park III; The Dinosaurs of Jurassic Park III; The Special Effects of Jurassic Park III; The Industrial Light & Magic Press Reel; The Sounds of Jurassic Park III; The Art of Jurassic Park III; and Montana: Finding New. Behind the Scenes: a Tour of Stan Winston Studio; Spinosaurus Attacks the Plane; The Lake; A Visit to ILM; Dinosaur Turntables; Storyboards to Final Feature Comparison; and Production Photographs. While fans of the films will love this set, especially in 4K, I'm a little leery to recommend you run out and buy it since they are still filming new movies for the franchise. However, for the ones that have been released on home entertainment, these are the best quality you will get for now. Download Jurassic Park 25th Anniversary Collection from the iTunes Store in Digial HD. For more information about Jurassic Park visit the FlickDirect Movie Database.